So satisfying finishing a sketchbook! This is the second one I filled last year. I was musing to a friend this week that December always feels overwhelming to me. Much to do and much pressure to be sociable. I always feel tired, I almost always catch whatever summer cold is going around, and my patience is stretched about as tight as Madonna’s face. Which is odd right now, because I know that I am not nearly as busy as I used to be. I look back at old me and wonder how on earth I got everything done. But yet, right now in this moment, it still feels as though I have the weight of the year upon me. Perhaps my load is less visible than in previous years; I don’t know. And I know I am not the only one. When I remember, I tell myself to stop fighting against it all. 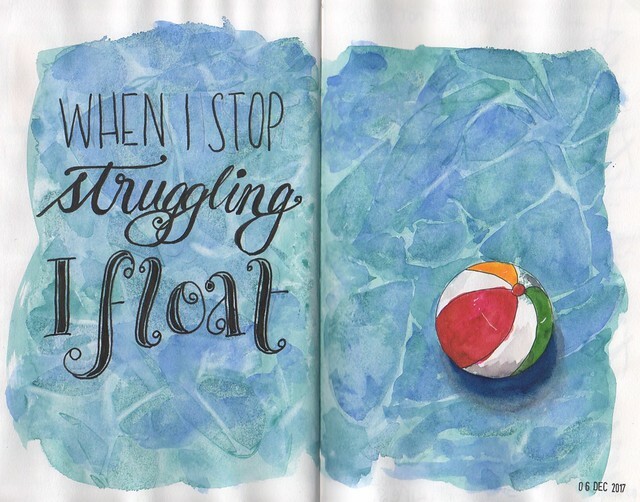 Relax and float. I get rid of any debris that doesn’t have to be around me. Most stuff can wait until the new year. Some things you cannot avoid completely, but like the ball in this painting, I can push it away from me for a while at least. If I am at work and feeling particularly overwhelmed, I treat myself to lunch at the local Japanese restaurant. They have a tea called “blooming tea” that I order and stare at and breathe in the floral scents. This one was rose, camellia and lemon flavoured. Click HERE to watch this beautiful, hypnotic little dance…the bundle unfurls in the hot water and pops out to release the flowers. They serve it to you in these lovely delicate glass teapots so that you can see the flowers and bubbles as they come to life. So good. There is something special about tea and its rituals that creates space and quiets the mind. I think it is the same with art. Some of the work I do in my sketchbook feels forced, I am drawing to occupy time, or to learn something or to keep up with a challenge or class. The pieces lack depth. But then there are times when I hit a vein and my heart and soul bleeds out onto the page. 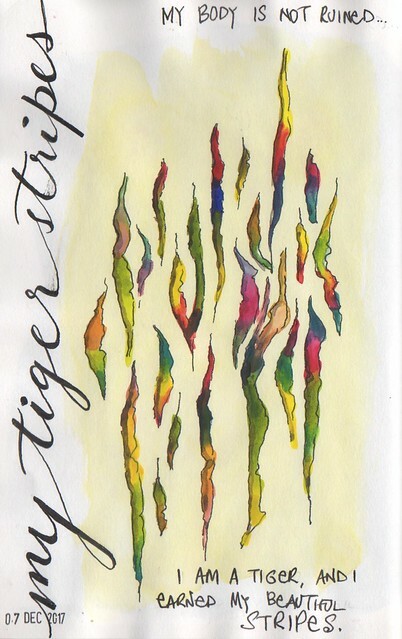 The page below is a painting of my stretch marks the flowed out earlier this week. Some consider them ugly, unsightly, a taboo of some sort. They are of course entitled to their opinions. I know that these stripes were earned growing my children and thus intrinsically valuable. My belly provided a safe place for them to grow. My stripes are beautiful and I will no longer apologise to those who seek the belly of a prepubescent child on their woman. I am proud of my stripes, which is why I have painted them in glorious rainbow colours. 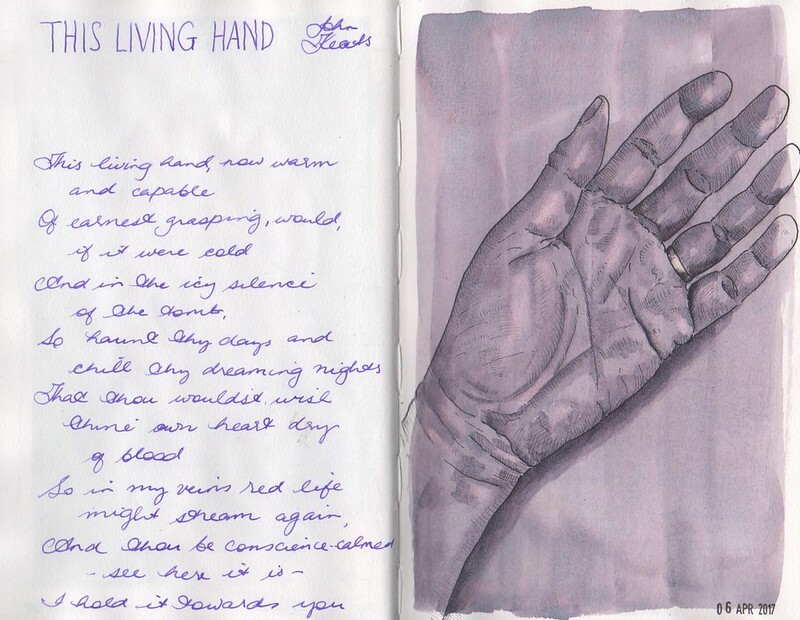 I hope that over time I bleed more frequently onto my pages, both with art and with words, for it is in these moments that I feel the weight lifted – even in December. 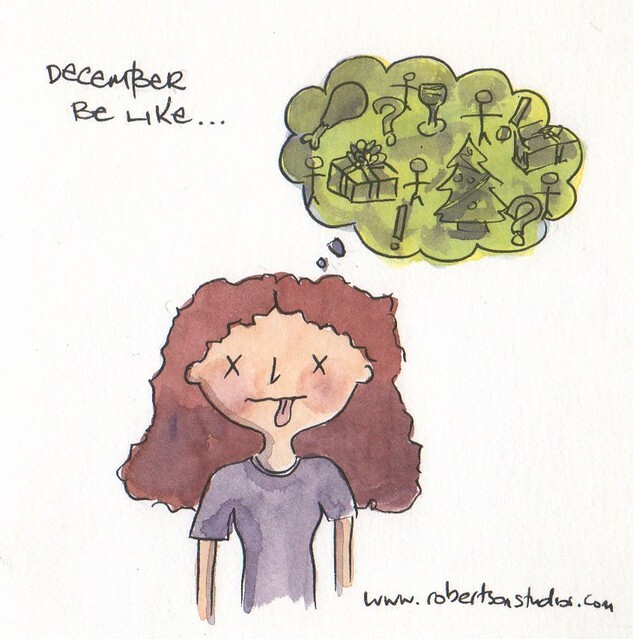 Do you feel overwhelmed in December too? How do you cope? 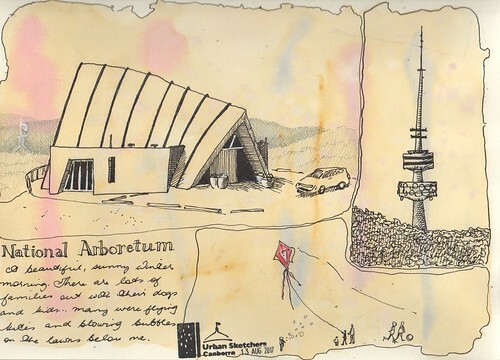 urban sketching at the Arboretum and a video! Today has been one of those exceedingly rare perfect Winter’s days in Canberra. Bright blue skies, not *too* cold, and zero wind! 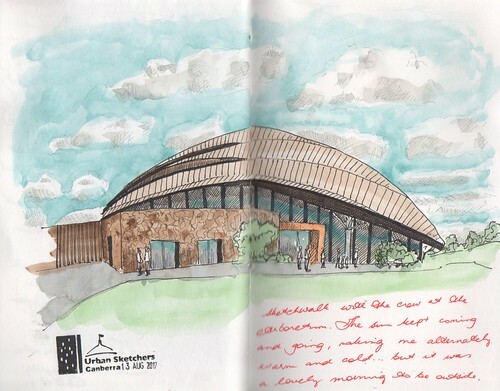 The past couple of days have been unpleasantly windy, so I was very pleased to have a change in the weather for today’s Canberra Urban Sketchers sketch walk. We met at the National Arboretum and chattered for a bit, as we do, before scattering do our own thing for a couple of hours. I came prepared with a page in my large sketchbook already painted to give me a background for some more detailed line drawings. I like the way my little collage turned out, but should perhaps have chosen a more muted palette with some earthy colours. I finished the first drawing more quickly than I thought, so I pulled out my small sketchbook and turned my little stool 180 degrees to draw the main building. There were lots of kids blowing bubbles and flying kites and rolling down the steep embankments. The happy laughs and astonished exclamations as kit’s took flight was a lovely backdrop to my sketching in the sun. Yesterday I filmed a flip through of my last sketchbook. I’m experimenting with my son’s GoPro camera and learning how to use iMovie. Nothing flash 🙂 I find it really fun looking through sketchbooks as a body of work. I can easily tell if I was enjoying a picture or if I was rushing, or was struggling with it for whatever reason. The ebb and flow between the covers is really interesting. I hope you enjoy watching too! This time three weeks ago I was sitting in the Barrowboy and Banker Pub at London Bridge …. today it is the location of a terror attack. It is a sobering thought. The thing I love about the Londoners is their ability to deal with this stuff without turning it into a major drama. They are not pushovers, but they respond rather than react. They have been dealing with terrorist attacks since WWII… from the Nazis through to the IRA and now wahhabists. It shows. They will carry on, and they will continue to live and thrive in their gorgeous city that I was lucky enough to explore for a short while. London, I love you. In case the slideshow doesn’t load you can see the Flickr set here. When I was a kid “turning on the waterworks” meant ‘crying for effect’. 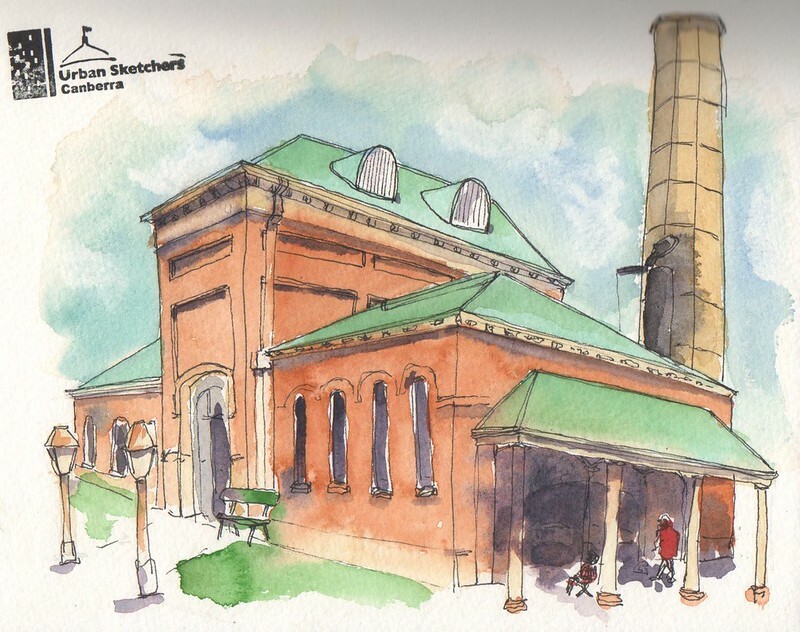 Today it meant a visit to the Goulburn Historical Waterworks with the Canberra Urban Sketchers. The big old beam-type engine is only fired up a handful of times each year, and today was one of those times where they fired up the more than 200 year old behemoth. There was a team of men stoking the fires outside, and another team inside the pump house ensuring that everything was well oiled and running smoothly. For my first sketch I propped myself in a corner to draw the part of the engine that is above ground. The smell of hot oil and gentle hum of the giant machine was just divine, and drawing her was a meditative experience. This is my first urban sketch done whilst standing, and I took the opportunity to test out the kit I intend to take with me when I visit London in a few weeks. It was a little awkward without a board of some sort to clip my palette to etc (my current one is too big to fit in the bag I intend to use), so I may have to play with creating a board that will fit in my bag so that I don’t need to juggle so much. I was pleased with the looser style sketch… I wasn’t too fussed about having perfectly straight lines or capturing every minute detail, rather, capturing the feel of the machine so that I can remember how it felt to be there when I look back at the sketch in the future. I believe this is the only running engine of its type in the world. The engineers are understandably very proud of their Appleby. This sketch took me about an hour all up and I had some time to spare before meeting up with he rest of the group to share sketches, so I headed outside to grab a quick sketch of the outside of the building. I was a little rushed and ended up with some pretty messy bleeds where colours flowed together. I spent half an hour drawing and about 15 minutes splashing paint around..it would be fun to go back with a little more time on my hands to sit and do the lovely old building justice. I need to figure out how to paint quickly without ending up with colours running everywhere. Less water is one solution (I used water brushes today … notify favourite, but they are convenient for travelling), another would be to get comfortable with leaving white space, or slim margins of untouched paper, between the blocks of colour….or I could embrace the blotches as part of capturing something quickly. We have a hugely talented bunch of people in our sketching group. At the end of each gathering we get together to share our sketches and experiences. I am so grateful to have such a supportive and fun group to be able to meet up with! A delicious little package arrived for me this week from Sweden. I’m sad to say it was not this lovely little robot, but rather a book that he features in … Mattias Adolfsson’s “All in Line”. 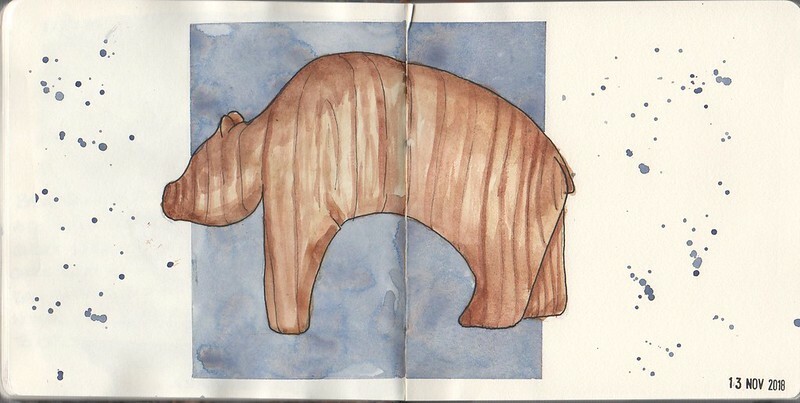 I raved about Matttias’ work a couple of weeks ago in THIS post where I showed you a couple of sketchbook pages I had produced as a result of his class at Sketchbook Skool. 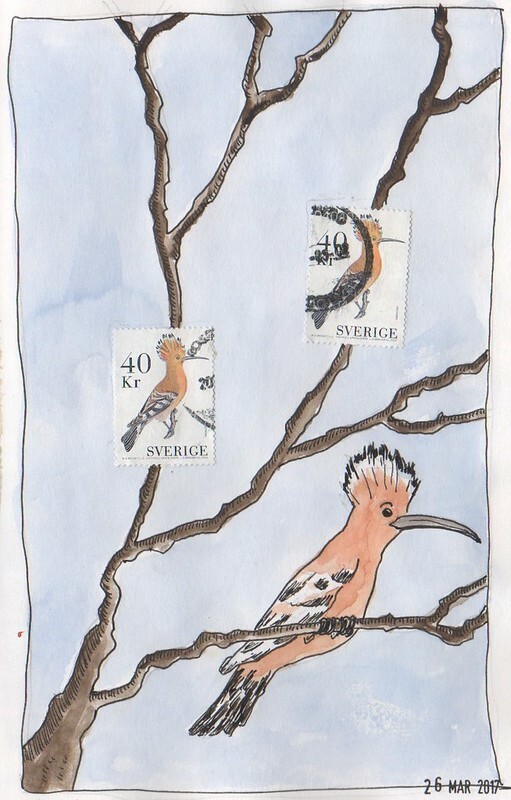 The package came with a three Swedish stamps, however I failed to remember all of my childhood philatelic skills and only managed to remove two of them without tearing. Since I no longer collect stamps, I decided to use them in my sketchbook. I have no idea what kind of bird this is, but he’s rather striking with that fouffy (yes I made that word up) crest and stripy flight feathers! 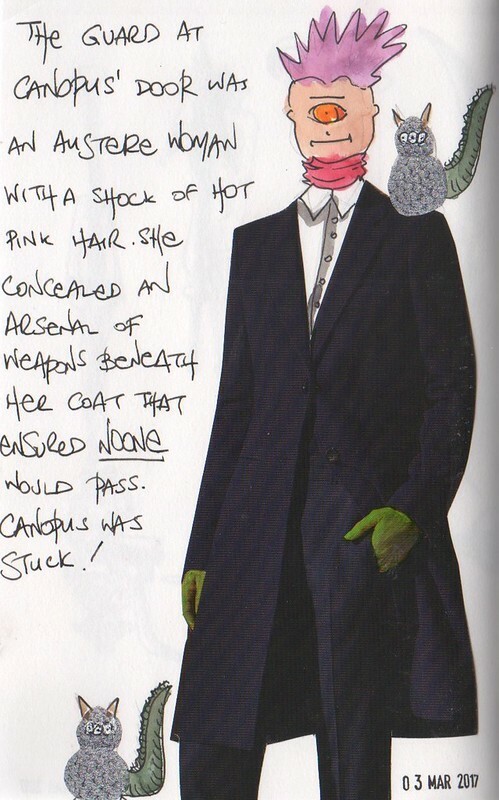 I’ll leave you with a couple of my favourite pages from Mattias’ book. 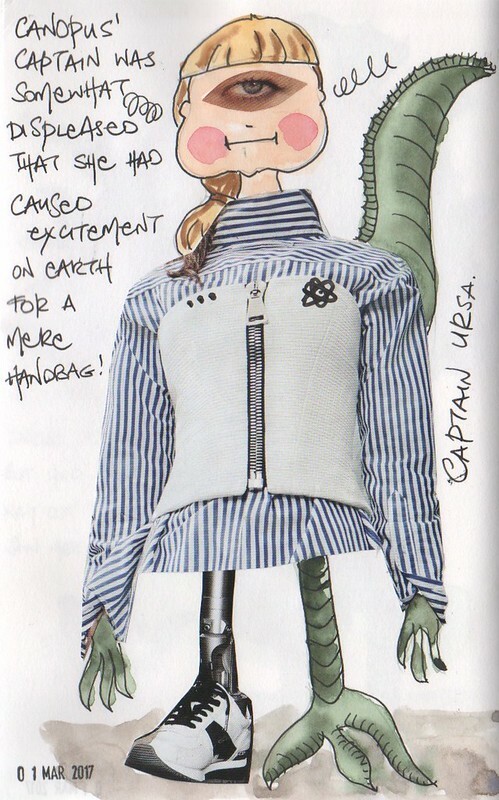 The detail and whimsy is so wonderful! I can see I will be leafing through this book many many times. I have been lucky enough to have a weekend where I was free to get out and draw on location for a couple of hours each day. It’s such a lovely, relaxing way to pass the time and decompress after a busy week. Today’s outing was with my local Urban Sketchers group, and we ventured out to the Shannon’s Wheels car show. It was heaven! I was like a kid in a lolly shop…so many shiny things! 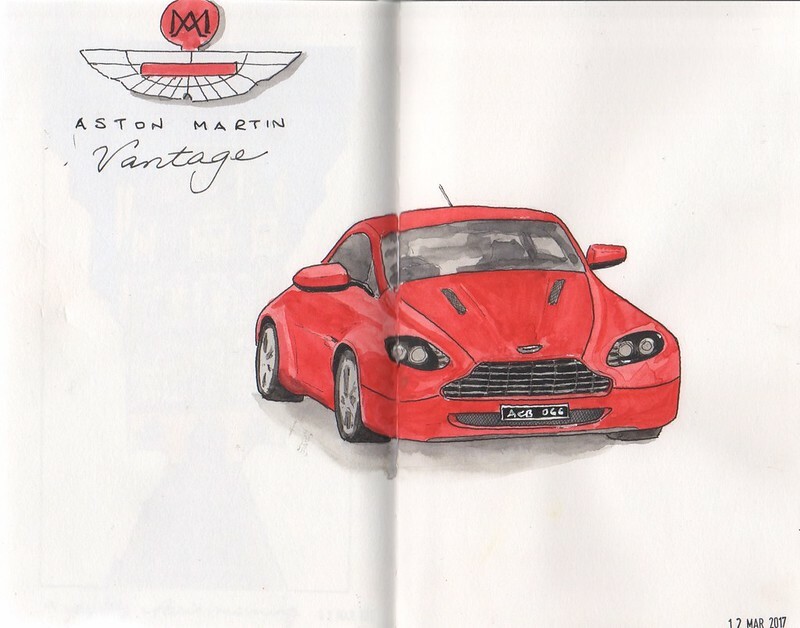 I was hoping for an old Morgan to draw but couldn’t find one…so I set up shop by the Aston Martin club set up and drew this fabulous red Vantage. There was a DB9 there that I would have preferred to draw, but it was obscured by flags and such. I had an attack of nerves when I first sat down to draw. Being situated in the midst of a crowd was pretty confronting; I am almost always tucked away in a stairway or under a tree or something , but this time it was me and my stool in the middle of a carpark with people streaming past constantly. My hand shook ridiculously for the first half an hour or so. 😐 In the end I settled and even chatted to a couple of elderly gentlemen that stopped for a sticky beak. I am mostly pleased with how this turned out after two hours of faffing about…some of the proportions are a bit off, but not bad for a location sketch I think. 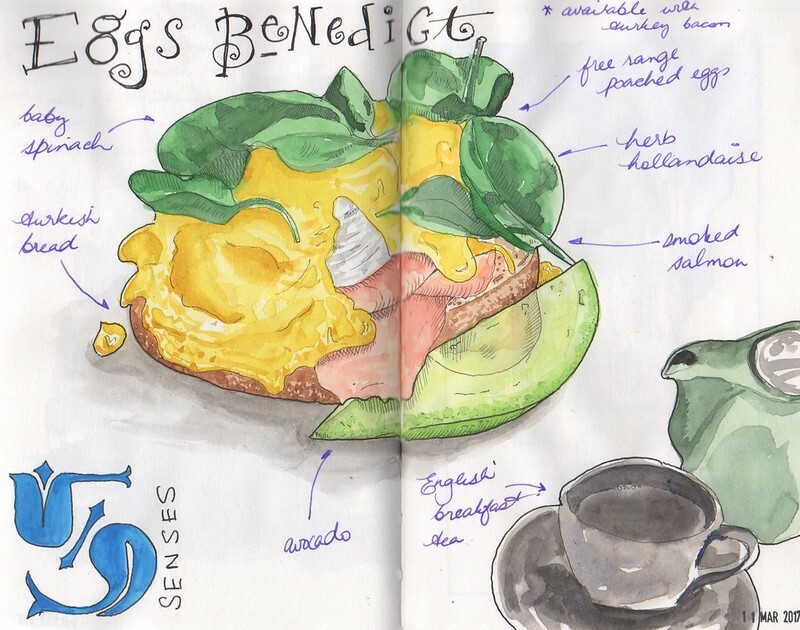 Yesterday’s adventure included a solo brunch excursion to the Five Senses Gourmet Bar so that I could draw something lovely and edible for this week’s Sketchbook Skool assignment. I spent a couple of hours drawing and painting and it felt like five minutes… I love it when that happens! My food was of course cold by the time I got to eat it, but it was still delicious. The other patrons were particularly chatty and curious, as were the staff. At one stage the chef was sent out to have a look. Most were aghast that my eggs were getting cold. I would like it noted that whilst this yummy brunch presented something called “turkey bacon” I opted for the salmon variant since there is clearly no such thing as turkey bacon! Bacon can only come from piggies and this is the way it must remain! Drawing in public is always an adventure. I hope my nerves settle as I do it more often. People are of course invariably lovely and say nice things, or tell me about how they used to draw, or how they can’t draw a straight line or a stick figure. And they aren’t there for more than a minute or two anyway. 🙂 As with anything…practice! It’s a long weekend here in Canberra, so I may yet get out for another adventure tomorrow. I hope you are having a wonderful weekend too. 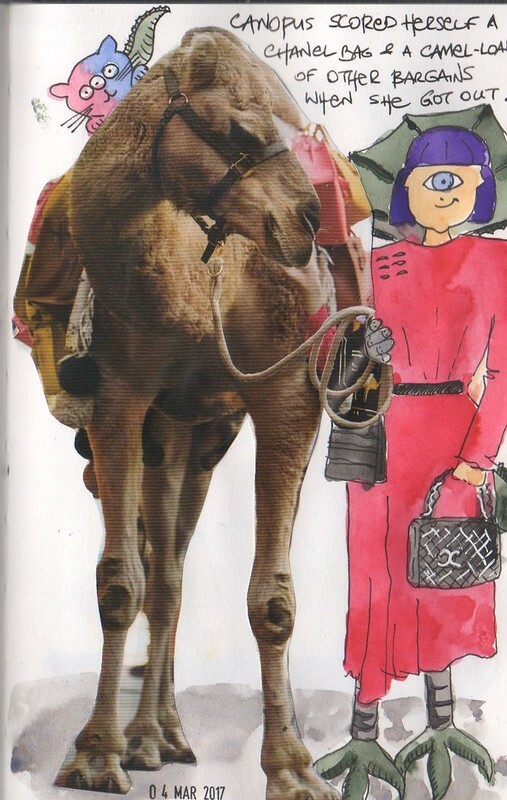 I had the best time doing my Sketchbook Skool assignment this week! This week’s lecturer was Nelleke Verhoeff of The Red Cheeks Factory. 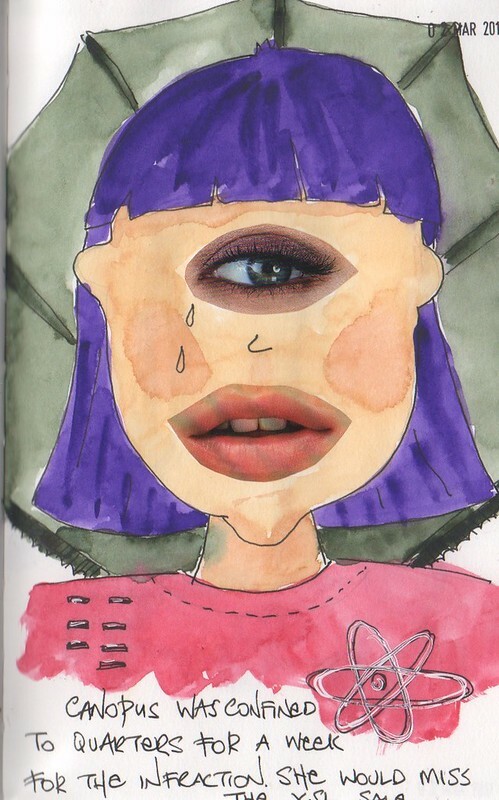 She had us creating characters and odd faces, taking inspiration from magazines and creating a series of images from the characters that popped up on our pages. 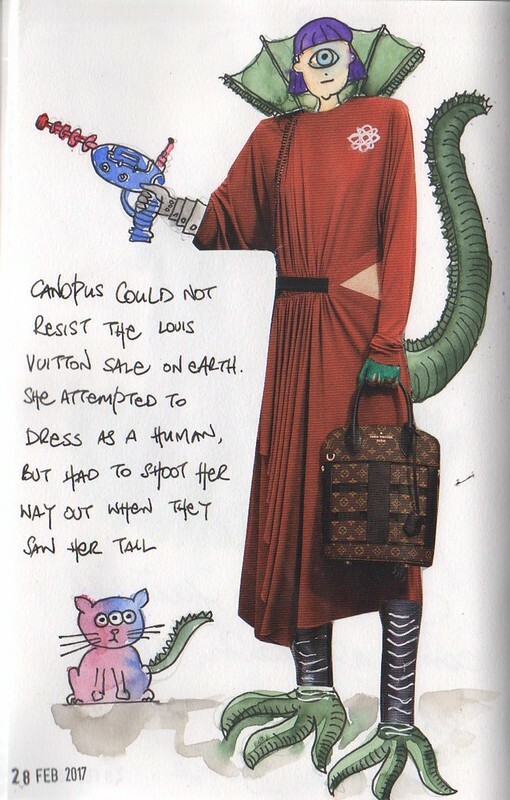 I ended up with a high fashion alien with a penchant for handbags called Canopus, and her three-eyed cat. They had a bit of a misadventure whilst shopping, but it turns out well in the end. I wasn’t sure I was going to enjoy this exercise, but it sort of took on a life of its own in the end and I had a blast just playing and seeing what came out 🙂 It’s a fun technique, and one I am sure I will play with more in the future.